Dominic Lipinski / PA Wire/Press Association ImagesCorbyn still has the support of the Labour Party membership but not MPs. Labour is tearing itself apart with infighting over the Party leadership but there is unlikely to be a resolution anytime soon. A YouGov poll of Labour voters for Citi shows that there is no clear favourite among the party’s supporters to replace Jeremy Corbyn, who overwhelmingly lost a vote of no confidence by MPs on Tuesday. 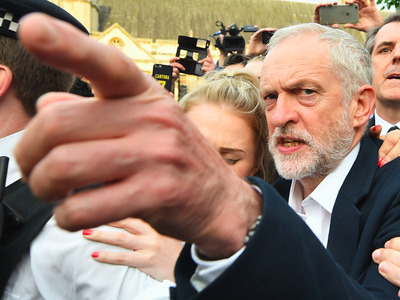 Corbyn is refusing to resign but his position looks increasingly untenable. 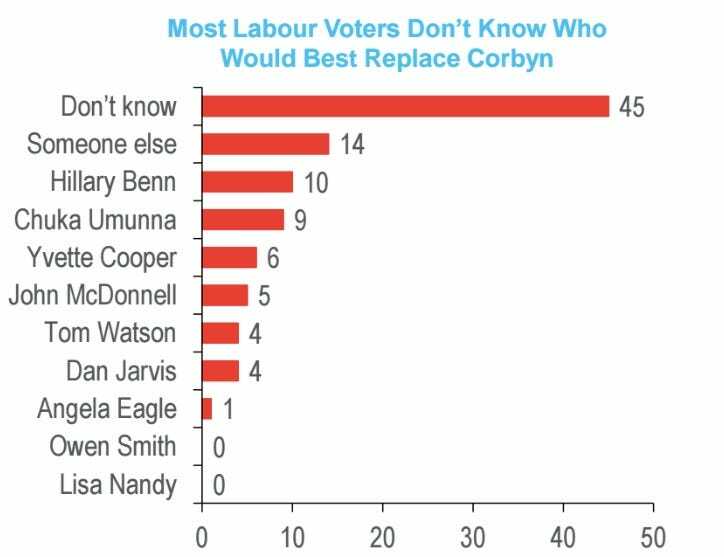 45% of voters “Don’t know” who should replace Corbyn, while another 14% just think “Someone else” should — almost as good as a “Don’t know” vote. The most popular candidate to be the new leader of the Labour party is Hilary Benn, who was fired by Corbyn as shadow foreign secretary over the weekend. YouGov’s polling also shows Corbyn still has the support of Labour party members, despite losing the backing of MPs. 54% said they think Corbyn should remain as leader, against 35% who think he should go and 11% who don’t know. That supports Corbyn’s argument for staying — that he has the support of the membership and must do right by them. 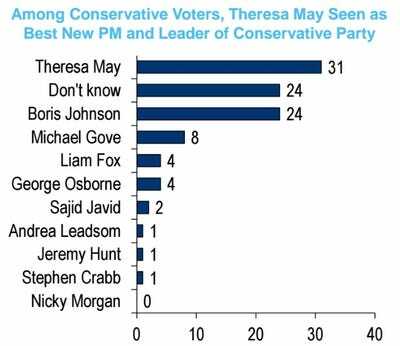 The polling by YouGov was conducted for Citi on June 26 & 27, prior to the vote of no confidence in Corbyn, so attitudes to his exit may have shifted since then. However, the chart above shows that even if party members have changed their mind, there is unlikely to be a swift resolution as there’s no one to replace him. Effectively, the Labour Party is paralysed. Corbyn does not have the support of the Parliamentary Party, meaning he cannot get any business done in the House of Commons or properly hold the government to account. But he is refusing to resign and even if he did, the new leader likely would not have much backing from the party. MPs blame Corbyn for failing to galvanize the Labour vote in favour of remaining in Europe, which in part lead to the victory for Brexit. 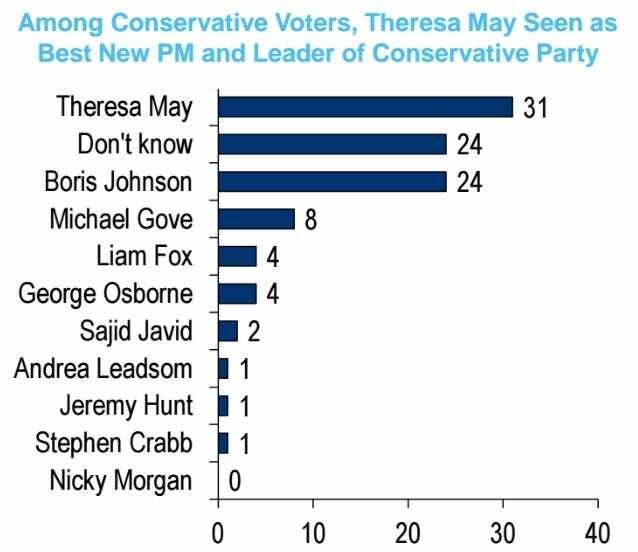 Meanwhile, YouGov’s work for Citi shows that Home Secretary Theresa May has a slim lead over Boris Johnson among Conservative Party members to be the next leader of the party and next Prime Minister. Nominations for the next Tory Party leader open on Wednesday. Work and Pensions Secretary Stephen Crabb is the first confirmed candidate on the ballot.